All of the theories in the book are backed up by empirical experimentation. While sample size always needs to be considered, having real numbers trumps gut feel every day of the week. The way he runs each experiment is telling. He always sets out to answer a question that bothers him then comes up with a data driven answer. Curiosity coupled with experiment makes for great reading. There are so many lessons to pull from this book that it would be a shame not to list them all here for a Cliff Notes review at the very least. That is the purpose of a lot of these business book reviews, to make sure that the lessons are extracted for future reference. They also help me distill what I took as the most important nuggets from a particular author’s teaching. So without further ado, let’s dive in. His next experiment dives into why we find “FREE!” so exciting. His theory is that something free gives us such a charge because, “…humans are intrinsically afraid of loss. The real allure of FREE! is tied to this fear. There’s no visible possibility of loss when we choose a FREE! Item (it’s free). But suppose we choose the item that’s not free. Uh-oh, now there’s a risk of having made a poor decision – the possibility of loss. And so, given the choice, we go for what is free.” Removing this risk of a ‘poor decision’ drives us to make all sorts of poor decisions like buying two for one deals of items that you never would have bought one of in the first place. I have an uncle that is famous for this, he once bought a case of Italian salad dressing, even though he doesn’t like Italian salad dressing, just because it was ‘such a good deal’. He also goes in to how valuable social norms can be in the business world. Take open source software for example. Who would have ever thought Linux or Wikipedia would have been so popular? He gives another example of a group of lawyers that were approached to help out a retirement community. The community asked if they could help and offered to pay them well below their normal fee. The firm said absolutely not. They asked again but this time if they would consider doing it for free. The firm readily agreed. They had gone from a market norm to a social norm. He also examines the social contract in modern day business. Businesses used to take care of their employees with pensions and, at the very least, solid benefits. Nowadays, these things have been cut and businesses bemoan that they can’t find loyal employees anywhere anymore. You can’t have it both ways. Loyalty comes from social norms not market norms. He devotes a whole chapter to the fact that we are incredibly stupid when we are sexually aroused. Well duh. I loved his study on the high price of ownership and the “Ikea effect.” He has a great line in there, “In fact, I can with a fair amount of certainty say that pride of ownership is inversely proportional to the ease with which ones assembles the furniture.” You spend time on something, you add a value of ownership to it. This ownership effect is another cause for irrationality. This can be summed up in the maxim, “‘One man’s ceiling is another man’s floor. ‘ Well when you’re the owner, you’re at the ceiling; and when you’re the buyer, you’re at the floor.” According to Ariely, this irrationality is propelled by three quirks: 1) we fall in love with what we already have 2) we focus on what we may lose, rather than what we may gain and 3) we assume other people will see the transaction from the same perspective as we do. He’s fascinated by the study of the placebo effect and rightfully so. The placebo effect is an amazing way that our mind controls our body. What was most fascinating about his study though was how big of an impact price has on the placebo effect. When study participants were given placebo drugs, they did far better in their treatment when they found out that the placebo drug was very expensive. He then dives into all of the experiments he ran on cheating. This stuff was fascinating. “when given the opportunity, many honest people will cheat. In fact, rather than finding that a few bad apples weighted the averages, we discovered that the majority of people cheated, and that they cheated just a little. The second, and more counter-intuitive, result was even more impressive: once tempted to cheat, the participants didn’t seem to be as influenced by the risk of being caught as one might think…This means that even when we have no chance of getting caught, we still don’t become wildly dishonest.” He then primed the pump in his experiments by having folks recall the Ten Commandments before the experiment and, “the students who had been asked to recall the Ten Commandments had not cheated at all.” So there is definitely something to these honor code things. Finally, what he found out is that “cheating is a lot easier when it’s a step removed from money.” Any time they ran their experiments on tokens that were worth a certain amount of money, cheating went up dramatically. This means cheating on things like airline miles is far easier to do because it’s not linked directly to money. He cautions banks not to get to far away from real money because of this effect. As a closer, he offers a plan of action. “although irrationally is commonplace, it does not necessarily mean that we are helpless. 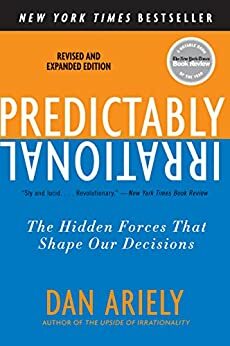 Once we understand when and where we may make erroneous decisions, we can try to be more vigilant, force ourselves to think differently about these decisions, or use technology to overcome our inherent shortcomings.” Very cool stuff and a ton of lessons to take away from this book.